One of the hottest topics in immunology today is the regulatory T cell — thousands of publications, hundreds of reviews. But few if any of the reviews go into any detail on the history of the TReg, instead coughing nervously, shuffling their feet, and hastily pointing out some shiny distracting fact over there. This is probably partly because the authors think everyone already knows the whole sordid story, partly because they don’t want to waste review space on spilled milk, and a lot because the story is embarrassing for those involved. TRegs are a type of T cell that, as you might guess, regulates the immune response — dampens reactions so that you’re not overwhelmed by the inflammatory response, and reduces the risk of autoimmunity. People and animals lacking TRegs have horrible, often fatal autoimmune diseases. TRegs were defined back in the mid 1990s or so, and the 2000s have seen an explosive growth in the field. But well before that — starting in the mid-1970s or before — it was known that there were T cells that could regulate (or, as the term was then, “suppress”) immune responses, and in fact much of the basic biology was worked out then. Immunologists identified the suppressor cell and used mouse crosses to identify its mechanism of action. They were able to precisely localize within the genome a molecule that was critical for suppressor T cell activation. This was the “I-J” determinant,1 and it was localized within the MHC region of the mouse genome. 2 Indeed, based on the biology I-J looked like another member of the MHC family. A great deal of work went into characterizing the I-J determinant,3 including the development on monoclonal antibodies against I-J4 and preliminary biochemical characterization of the molecule.5 In spite of a minority of skeptics, it was a very exciting time. We therefore conclude that the I-J gene is not formed by a DNA rearrangement between the I-A and I-E -subregions. … Our data suggest that the genes encoding I-J serologic determinants expressed by suppressor T cells do not map between the I-A and I-E subregions. 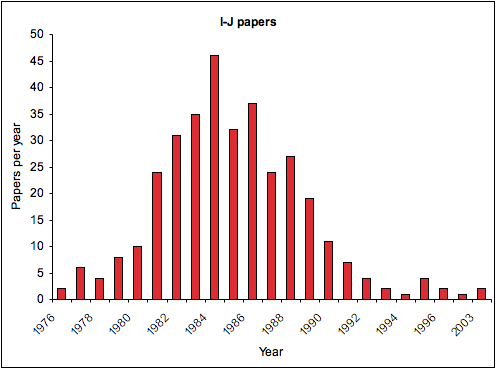 Here’s a chart of publications on I-J by year. See what happens in 1984? 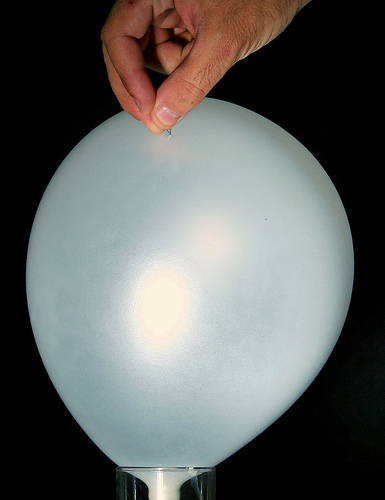 That is what a balloon popping looking like. For a few years after people still published stuff that had been in their pipelines, but no one was starting anything new, everyone in the field hurriedy left (mumbling to themselves) for greener pastures, and no one entered the field. What went wrong? I have no idea, to be honest. The people who were working on I-J included a lot of people who are much smarter than I am (including one of my scientific grandfathers, whose Nobel Prize is only the start of his achievements); my schadenfreude includes a great deal of “That could have been me”. The good news is that after the embarrassed pause, the underlying phenomenon itself turned out to be real and robust. 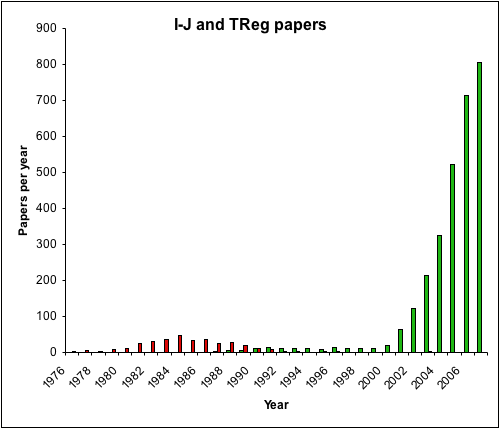 In the mid-1990s people returned to the field (giving the cells a new name to cover over the I-J fiasco), and TRegs have taken off (the chart below shows TReg publications, in green, compared to the suppressor papers from earlier). One lesson to be drawn from this, by the way, is the difference between science and pseudoscience. A lot of people had invested heavily in I-J. Yet when evidence disproved their hypothesis, the hypothesis was abandoned. What’s more, returning to the data with an open mind allowed the field to generate new hypotheses, test them, and when they turned out to work, to run with them. TRegs today are one of the most promising handles for a bunch of therapies. If this was pseudoscience, people would still be rummaging around the I-J field, attacking the people who disproved it, and rehashing old and useless experiments based on increasingly convoluted explanations for what turned out to be simply wrong. This entry is filed under Immunology, Miscellaneous, Science. You can follow any responses to this entry through the RSS 2.0 feed. Both comments and pings are currently closed. Is there a I-J determinant on purified Tregs? Today, I don’t think anyone knows what an “I-J determinant” is. It was defined by antibody responses rather than protein sequence, and when they sought protein sequences there was nothing there. I don’t know that anyone has gone back to the old antibodies and looked at TRegs — it would be an interesting study, but I think most people who were involved with I-J would be just as happy to forget all about it.